Six Sigma Methodology. – Procesos, Estrategias y Operaciones. The Six Sigma methodology uses a specific problem-solving approach and select Six Sigma tools to improve processes and products. People with expertise in Six Sigma are called green belts, black belts, or master black belts. The name Six Sigma came from the goal of reducing defects to 3 parts per million, which is ±6-sigma (including some process drift). Most companies produce at an average ±3-sigma quality level (99.73% good product), which generates 2700 defects per million parts. For most real-world situations, this is a level of defects that is excessively high, but the optimum quality level is usually not as tight as ±6 sigma. A realistic goal is to make a product that satisfies the customer and minimizes supplier losses to the point that it is not cost-effective to pursue tighter quality. The easiest way to implement Six Sigma in an organization is with complete commitment from top management. Although complete corporate commitment is desired, many of the Six Sigma tools can be used independently to make substantial improvements. This approach can cause bottom-up acceptance of Six Sigma. It is not necessary to use all the tools to have a measurable effect on reducing defects. 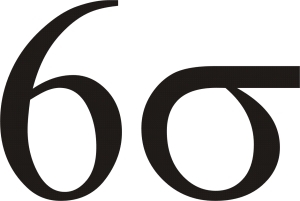 Some companies set up Six Sigma as a separate organization. This can cause some animosity. Another approach is to incorporate Six Sigma into the current organization, as an integral part of everyone’s current job. There are task-specific software programs for many of the Six Sigma tools, but these are not required to begin implementing Six Sigma.